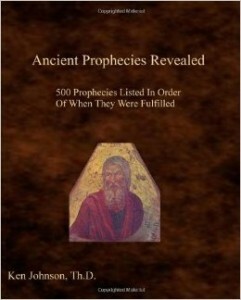 Originally self-published by Dr. Ken Johnson in July 2008, this book looks at 500 prophecies that can be found in the scriptures in the order that they were fulfilled. The version that I have is copyright 2010 and it is loaded with easy-to-reference charts and tables that group prophecies by topic or time period. The divisions include: Creation to Exodus, Exodus to the Rise of Babylon, Babylon to the Messiah, Messiah’s first coming, Death of Christ to the Dispersion of Israel, Prophecies about the Dispersion, Prophecies about Modern-Day Israel, the Apostasy of the Church, the Rapture of the Church, the Tribulation Period, and Millennial Reign. The introduction to the book details and explains the nature of 7 different types of prophecies, including those that reveal timelines, those that are symbolic, and those that are dual in nature. Whereas this book is an interesting read in and of itself, it also serves as an excellent reference tool for Bible study. I have used it on a number of occasions when I see something happening in the news and want to get an idea of how it relates to scripture. Not only do I find reference material with regard to the event I’m researching, but also cross-reference listings of other related passages and events. In our recent interview with Dr. Johnson about the birth of the Messiah, he related such instances from the book of Isaiah. Many are familiar with the prophecy that a virgin would conceive and ultimately give birth to a son that would be named Immanuel, but included in that passage is the prophecy foretelling the destruction of both Samaria (Ephraim) and Syria before the Messiah reaches the age of knowing good from evil (Isaiah 7:14-17). Overall, this is another of Dr. Johnson’s books that I feel would be a useful addition to the library of any person who wants a better understanding of the scripture, especially Ancient Bible Prophecy.